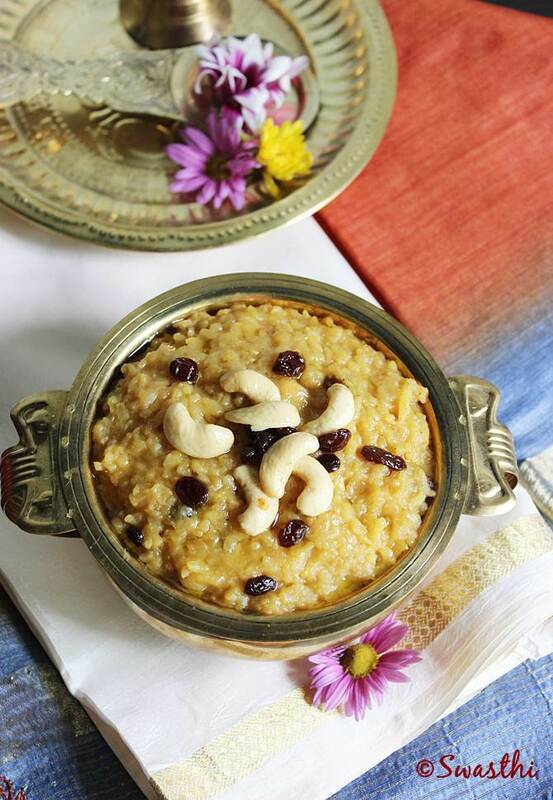 Sweet pongal is a delicious South Indian dish made with rice, moong lentils, ghee, cardamoms and nuts. 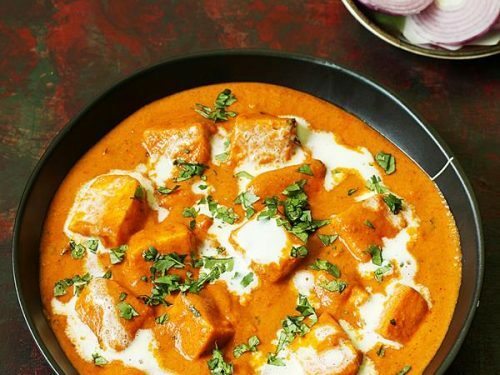 It is traditional dish mostly made to offer the gods on special occasions & festivals. 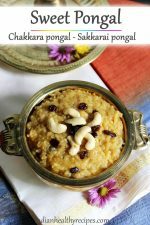 Sweet pongal is known as chakkara pongali in telugu & sakkarai pongal in tamil. Sweet pongal is made in many traditional south Indian homes on the day of Makara sankranthi or pongal festival. This dish is said to have been prepared by our ancestors to signify and celebrate – abundance and prosperity after the harvest. After preparing sweet pongal it was offered as naivedyam to the Sun God as a part of the Thanksgiving ritual or puja. 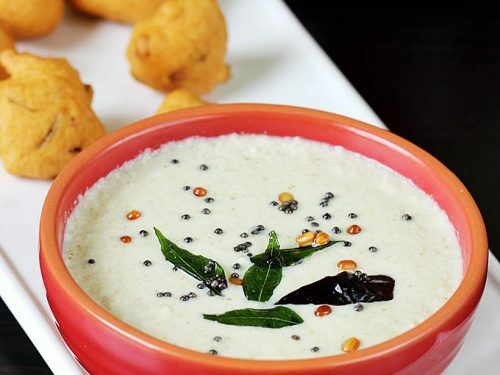 There are so many pongal recipes that are followed in South India based on the family traditions, customs, taste and main importantly region where they live. So one may find sweet pongal recipes with varying ingredients like moong dal, Cow’s milk, Cow’s ghee, jaggery, Coconut etc. Many temples in South India offer sweet pongal, ven pongal, puliyogare, & curd rice to the gods during the pooja and distribute it to the devotees. Sweet pongal is mostly made on fridays or tuesdays in Godess Lakshmi & Durga temples as these are the special days the godess is worshiped. So many traditional South Indian households too have this tradition of making them on every friday or tuesday apart from the festival days like pongal & varalakshmi pooja. 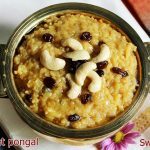 This sweet pongal recipe I have shared is a traditional one that is prepared in my home during most festivals including Dasara Navratri or Varalakshmi pooja and Sankranti or Pongal festival. 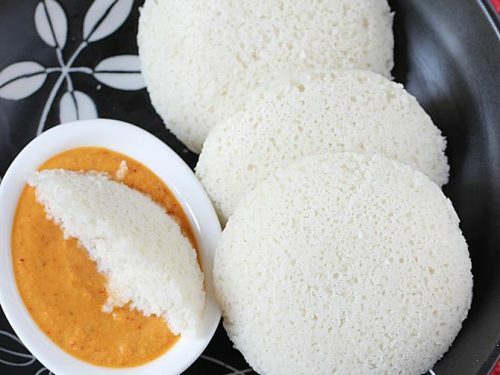 This is one of the Naivedhyam dishes we offer to the Gods or Godess Durga Devi and Lakshmi during the pooja. Roasting moong dal well on a low to medium flame until aromatic & golden brings out the aroma of the dal. This roasting part can be done ahead of time, cooled and stored in air tight jar. This saves some times on the day you plan to make the sweet pongal. Jaggery or sugar: Sweet pongal can be made either with jaggery or sugar. However traditionally jaggery was used especially for naivedyam. The chakkara pongal made with sugar lacks the flavor & does not taste the same as the one made with jaggery. Some people also use kalakandu or rock sugar. Ghee: Good quality desi cow’s ghee is the key to the unique aroma. Traditionally cow’s ghee is preferred to prepare any naivedyam foods. Do not skimp on the amount of ghee used to make sweet pongal. 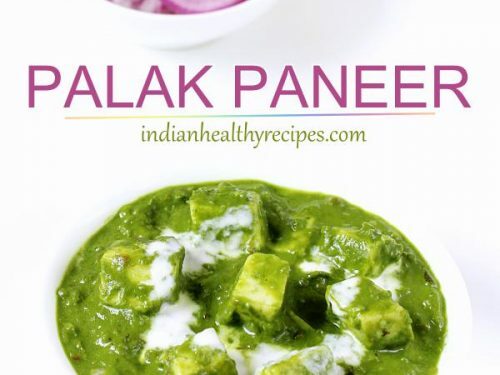 Use a generous amount of ghee as mentioned in the recipe. Flavoring : Cardamom powder, cloves and pacha karpooram or edible camphor are used to flavor the sweet pongal. If you do not like, you can skip the camphor. These 3 ingredients remind me of the divine aroma from Tirupathi Venkateshwara Swamy’s Boondi Ladoo prasadam, so I love to use these any time in my sweet pongal. Sweet pongal made in temples has lot of ghee. A generous amount of ghee helps to maintain the slightly gooey consistency for longer. So if you are making ahead for some occasion consider adding more ghee. Some people also use little amount of milk while cooking rice and dal. This adds a flavor but we do not use it. For healthier options, you can also use brown rice, millets, quiona or steel cut oats. Soaking them for a while helps to cut down the cook time. If you are a vegan just substitute it with mild flavorless oil. You can also check this collection of pongal festival recipes or sankranti recipes. This may help you to decide on your festival menu. This is a family recipe which I have been following for the measurements & the method as well. 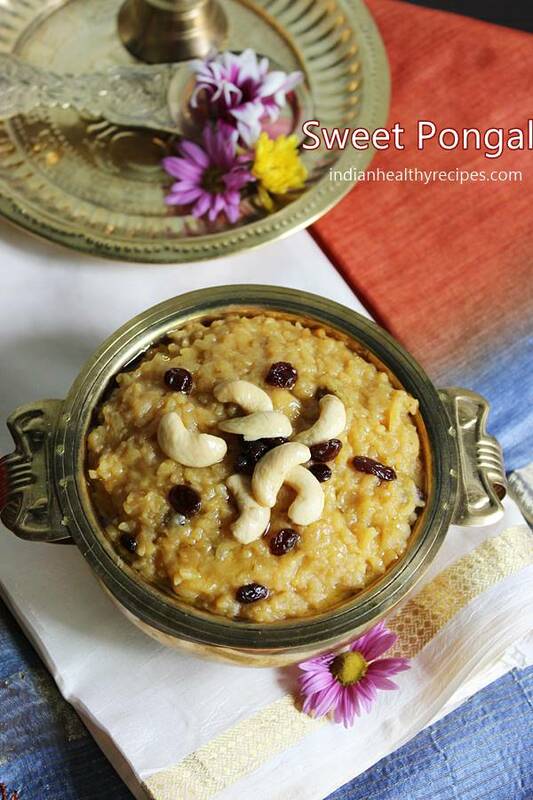 Sweet pongal or chakkara pongal is a sweet dish made with rice, moong dal, jaggery, ghee, nuts & raisins. It is also known as sakkarai pongal & is made during hindu festivals. 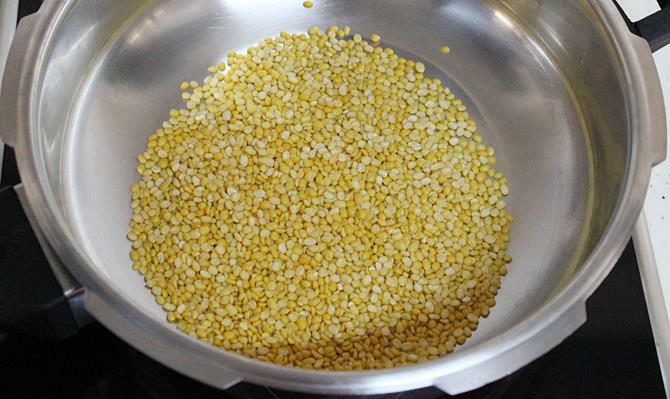 Roasting dal – Add moong dal or pesara pappu to a heavy bottom pan or pressure cooker and roast it on a medium flame stirring often till the dal turns fragrant. Next add rice to the same pan and wash both of them at least 2 to 3 times. Drain the water completely. 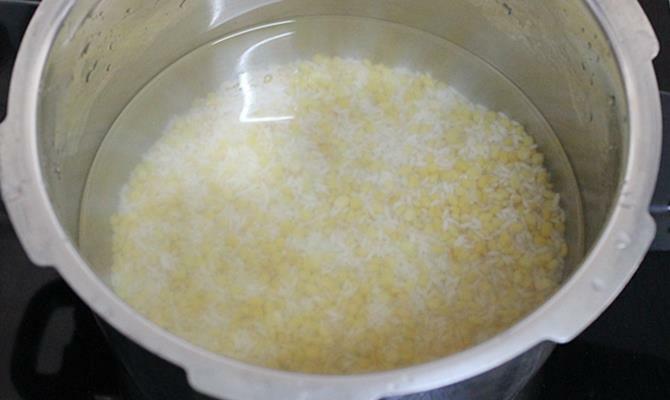 Cooking rice & dal – Pour 2 ¼ cups of water. Cook till soft either in the pressure cooker for 2 whistles or in the pot. You can also put the rice & dal in a bowl and pour water. Place the bowl in a pressure cooker. Pressure cook for 3 whistles. 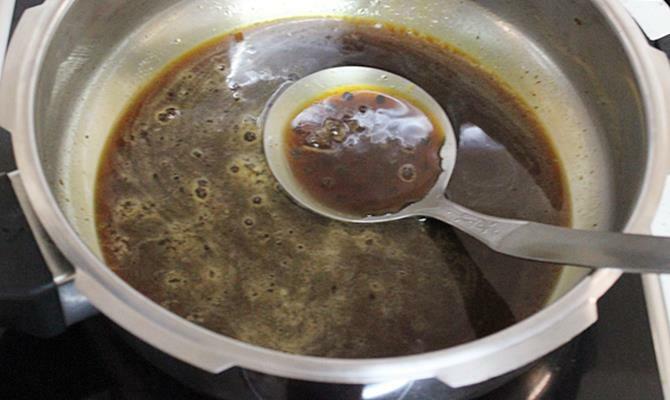 Making jaggery syrup – You can also skip this step & add clean jaggery directly to the mashed rice. If making syrup, transfer ¼ cup water & grated jaggery to a pan. On a low flame stir and melt it. Boil until slightly thick & sticky. Do not over cook as this turns too thick after cooling. Set this aside. When the pressure releases, open the cooker and mash the rice & dal lightly. Next filter jaggery syrup to the cooked rice & dal. Add green cardamom powder. 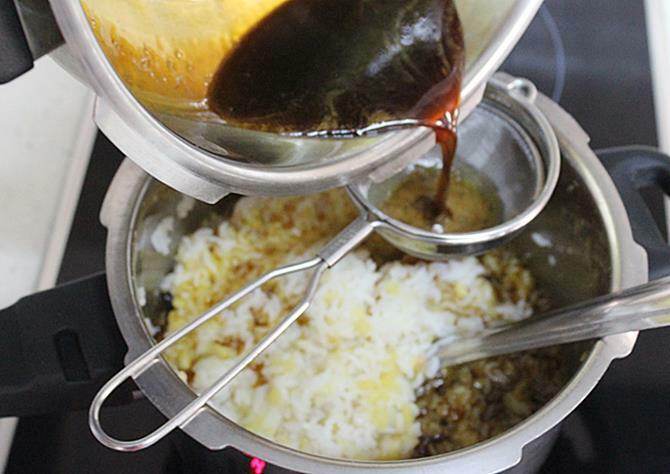 Mix and cook on a medium flame till the jaggery syrup blends well with rice. It should begin to bubble up well. Turn off the stove. Heat a pan with ghee on a medium flame. Add coconut pieces (optional) and fry them till they turn aromatic. Transfer only the coconut pieces to a plate. Fry cashews & clove till golden in the same ghee. 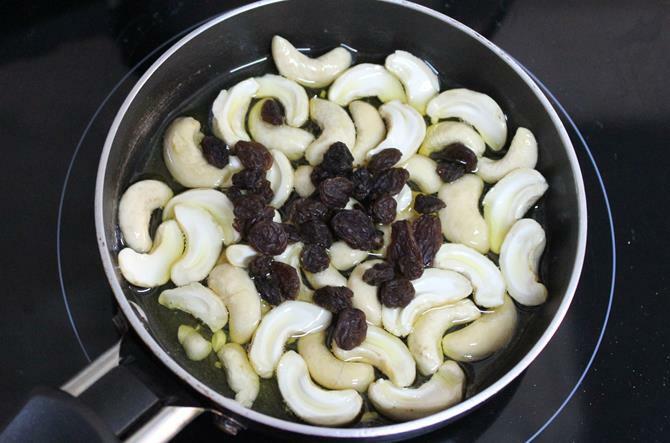 Add raisins and fry until they turn plump. Off the stove and add camphor (karpuram). 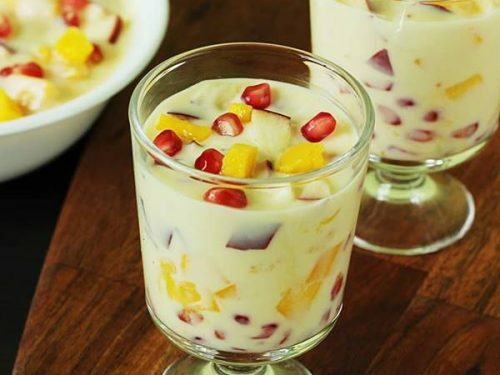 Pour this to the sweet pongal. Mix well. Chakkara pongal is ready. Always cool the food before offering to God or goddess or deities. Adding too much of camphor, can leave bitterness to the pongal. Before you add jaggery to the rice, make sure it is cooked thoroughly soft. 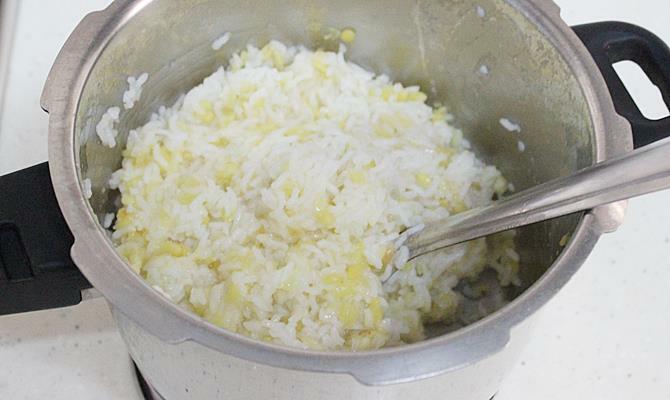 Rice tends to harden if the rice is not mashed or the pongal is overcooked. Please feel free to use as much ghee as desired. The quantity of ghee used totally elevates the flavor and texture of the sweet pongal. 1. Dry roast moong dal in a heavy bottom pot or cooker till you get an aroma. Keep stirring and roast on a medium flame. This takes around 3 mins. 2. Add rice to the roasted dal. Wash them well a few times with ample amount of water. Drain the water and pour 2 ¼ to 2 ½ cups of fresh water and cook till soft. The quantity of water may vary slightly depending on the kind of rice. 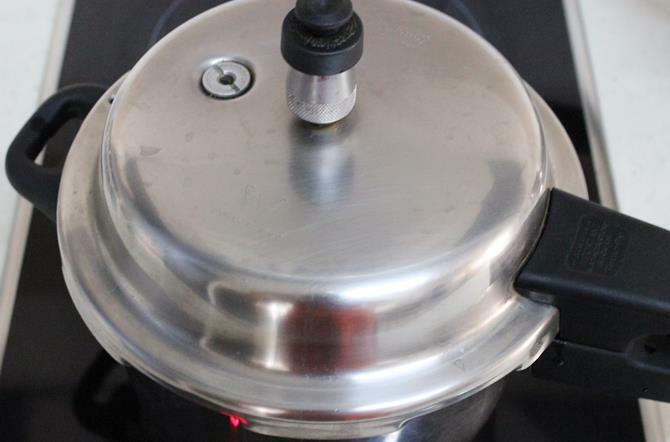 You can also cook the rice and dal in a pot-in-pot method in the pressure cooker. Place the bowl of rice, dal & water in a cooker. or You can even cook in a pot till soft. 3. Since I added the rice and dal directly in cooker, I cook for 2 whistles on a medium flame. If you place the rice and dal in a separate bowl in the cooker then pressure cook for 3 whistles. While the rice cooks, make the jaggery syrup. 4. If your jaggery is free from impurities, you can skip this step and add it directly to the cooked and mashed rice. Otherwise add ¼ cup water to jaggery and melt on a low flame. Most people do not do this, as I mentioned this is my family recipe and we do it this way. 5. Let the syrup begin to bubble up well. It must turn sticky, no string consistency needed. Set this aside. 6. Once the pressure has released open the cooker. Mash the rice. I prefer to mash lightly. 7. 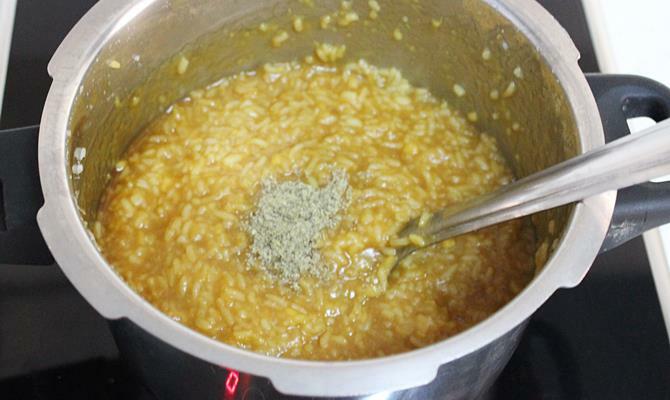 Filter the jaggery syrup to the rice and mix. 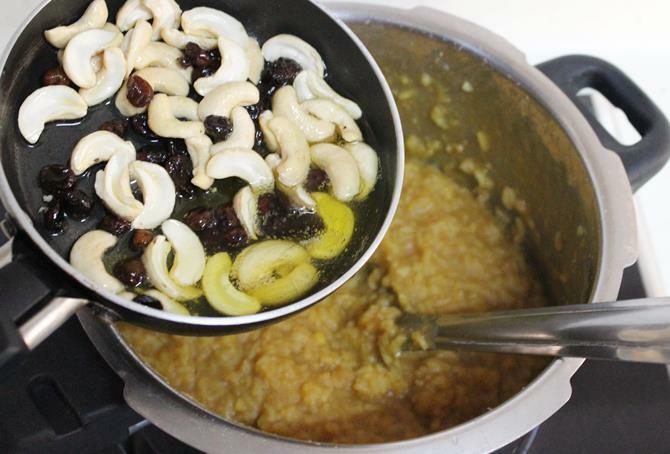 Some folks like to thicken the jaggery syrup first and then add to the sakkarai pongal. If you want to do that, filter the syrup to a separate pot and boil it till it thickens and then add it to the rice. 8. Add cardamom powder. 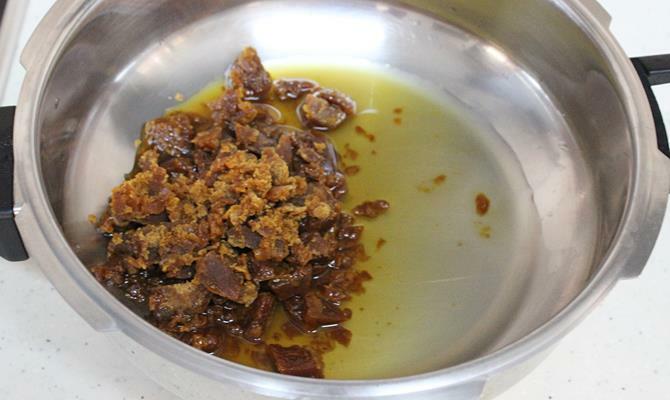 Begin to cook on a medium flame till the jaggery blends well with rice and begins to bubble up. 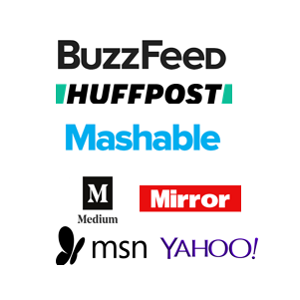 This takes around 5 minutes. Off the heat. 9. Heat ghee in a pan, fry cashews and cloves till they turn slightly golden. Then add the raisins and mix until they plump up. If using coconut, slice them thinly and golden fry first stirring often till they turn aromatic. 10. Then add camphor and pour this over the sakkarai pongal and mix well. Offer sweet pongal to the Godess. Cool the food always before offering to the Gods. You are welcome. Happy to know your sweet pongal turned out good. Thank you very much. Add Pacha karpooram to the ghee after frying raisins. I have mentioned it as camphor. I tried it on Sankranthi and it’s just superb.Thanks a lot for the receipe. 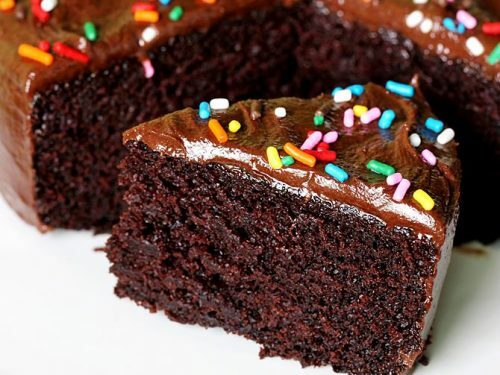 Swathi Garu iam thankfully to you I ALLWAYS use only your recipes to cook it comes excellent taste .your are doing very very very excellent job . Thanks for recipe… looks easy to cook.. This 2017 Pongal, i will prepare and distribute my room mates..
Glad to know you. Thanks for the mention. why do you have to filter the jaggery when its already dissolved? Jaggery always comes with some dust particles due to the processing. To get rid of that we have to filter. 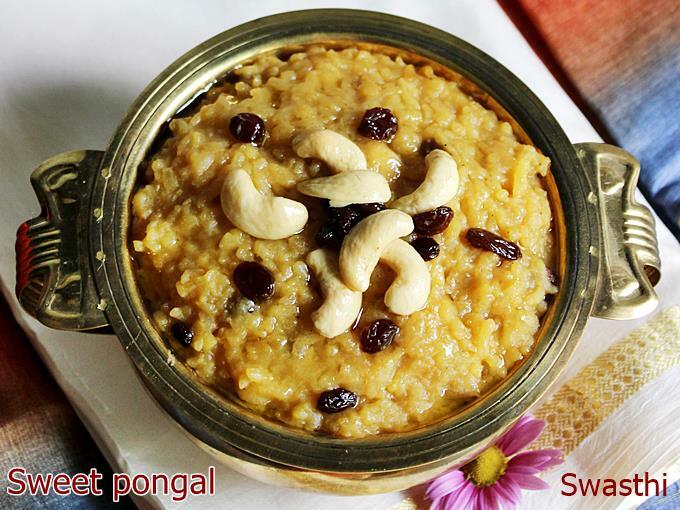 Mmmm…….Sweet Pongal is one of my favorite recipe. Lovely share !!! Tried sweet pongal today n once again it came out awesome.. Thanks for making the recipe so easy to follow n make..
Can’t wait to try some more recipes..